Good advertising normally needs to work in a place in between being too literal and being too "intellectual". 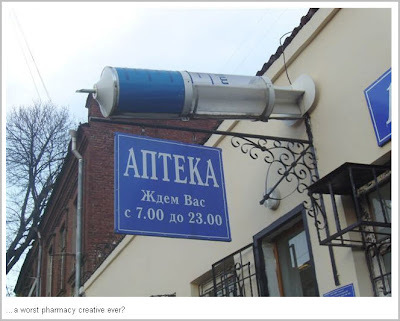 Apparently, whoever came with the idea for this pharmacy in Russia, didn't know or didn't care about that. Now, even if you don't know ANYTHING about creativity there is this thing called ¨common sense¨ that could have been useful when making the decision..., I truly believe that common sense would indicate that this is not only too literal but it can also be seen as too aggressive (I can't imagine trying to convince a kid that the shots in this place are not going to be painful!). On the bright side, I am sure it makes the place easy to find and a good reference when giving driving directions: "once you passed the pharmacy with the HUGE syringe, take a left...". Maybe that is how the owner wanted it, easy to spot and easy to recognize, no matter the negative connotations the sign may have!